Oh no!!! Only one day of Fallas left (after today). Am I saddened, relieved, or an exhausted mixture of both? If we have one piece of advice for tomorrow, it’s that you should try and make the most out of it. Rest is for Friday, and you won’t want to miss out on any of the highlights. Starting with the 14:00 mascletà, which promises to be the most incredible of them all. 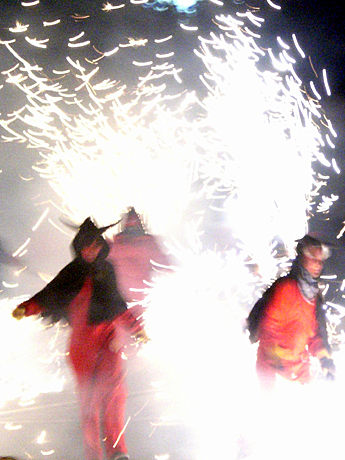 Another must-see event is the Cabalgata de Fuego, at 19h. This parade marches down Calle Colón, around the Puerta del Mar, and is as unique and exhiliratingly scary a parade as Fallas has to offer. Just try not to freak out too much if a devil sticks his flaming firework stick in your face. 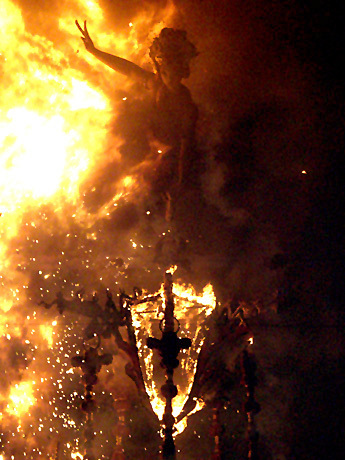 And of course, the night ends with the desperately-awaited Cremà, which starts around 1am. Pick your favorite monument, and try not to shed a tear as it goes up in flames. We’re still trying to decide which we’re going to see — our favorite by far this year was from the Plaza de Pilar, but that statue is found in such a narrow spot that it might make for cramped cremà-viewing. Where do you plan on watching it? – Looking for Fallas Posters?